Place the chicken in the slow cooker and sprinkle with the salt and pepper. Add the olives and capers and pour the Greek salad dressing over. Cook on LOW for 6-8 hours or HIGH for 4-5 hours. 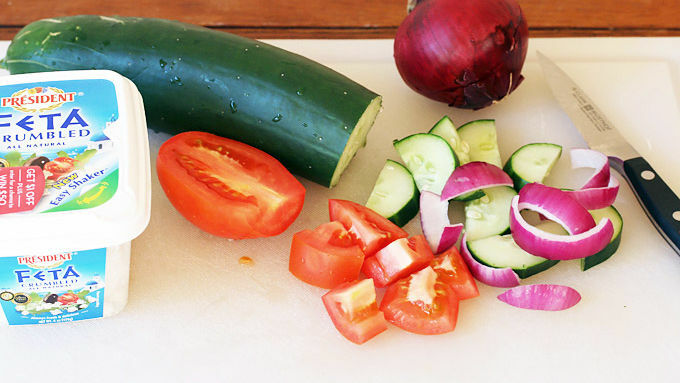 To make the Greek Salad: Combine the vegetables in a bowl and toss with the Greek dressing. Serve sprinkled with the Feta cheese. 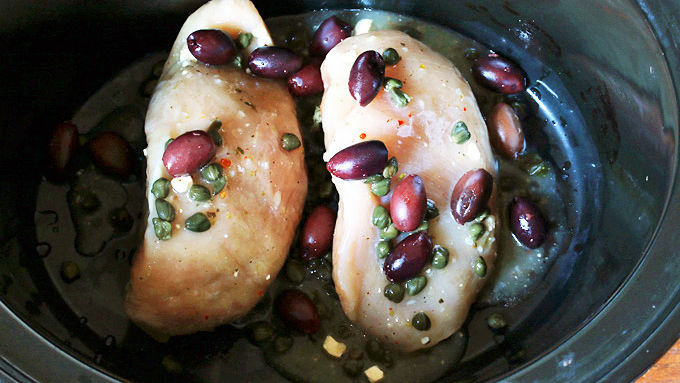 Serve the chicken with some of the sauce, olives and capers spooned over and a side serving of the Greek Salad. Fresh and incredibly easy, this simple Greek meal will leave you feeling full and happy. Effortless and delicious: There's a combination that's hard to find, but a definite keeper once you've found one. 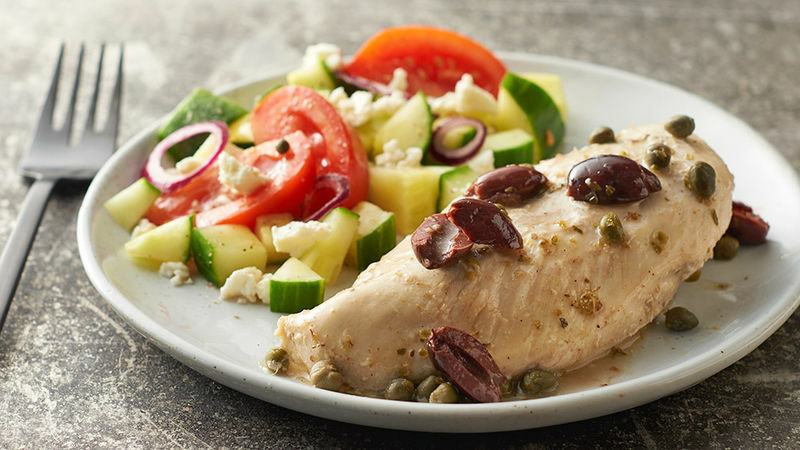 This Slow Cooker Greek Chicken is as easy as it gets. What's more, it's a recipe for a complete meal that shares some ingredients. The same dressing that's used for the chicken is tossed in with a fresh and vibrant Greek salad for an easy and healthy meal. And it's simply delicious! And did I mention it's superbly versatile? 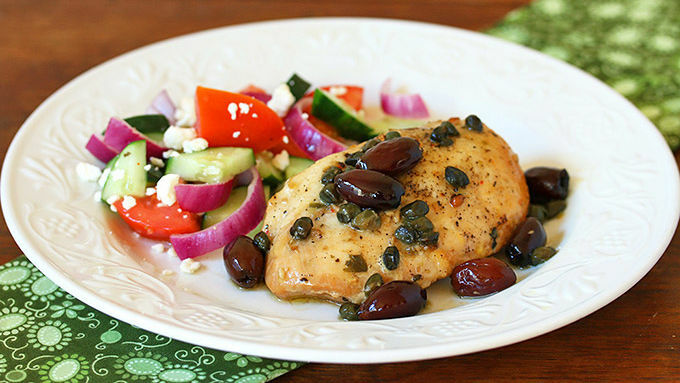 Here are just a few ideas: Chicken breasts served with the Greek salad (like the featured recipe). Cut the cooked chicken breasts into strips and lay them on top of a leafy salad with tomatoes, red onions and cucumber, then toss it with the Greek dressing and crumbled Feta cheese for a yummy Greek chicken salad. Shred the cooked chicken and layer it on some pita bread with lettuce, tomatoes, red onions, cucumbers, Greek dressing and crumbled Feta cheese for some delicious Greek chicken gyros. However you choose to enjoy this slow cooker chicken, you're going to love it.